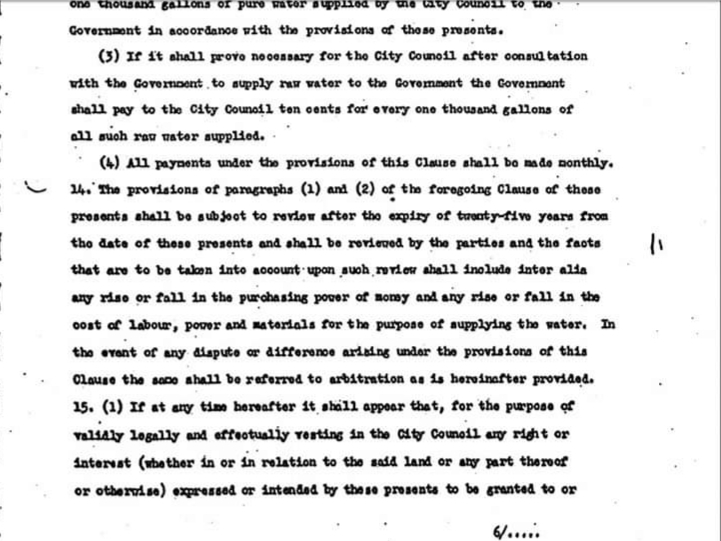 Read Point 14 of the 1962 Water Agreement signed between Singapore and Malaysia. The provisions of para (1) and (2) of the foregoing Clause of these presents “shall be subject to review after the expiry” of Twenty Five years from the date of these presents and shall be reviewed by the parties and the facts that are to be taken into account upon such review shall include inter alia any rise or fall in purchasing power of money and any rise or fall in the cost of labour, power and materials for the purpose of supplying the water. In the event of any dispute or difference arising under the provisions of this Clause the same shall be referred to arbitration as is hereinafter provided. There is no mention that the review must be done right after 25 years (i.e. at 25th year) and no other review could be done thereafter. As for this Water Agreement issue, it is clear that we might not be at the losing end if the conditions of review are met. Our supply of pure water to Johor may not stay at RM0.50 as the criteria that will be taken into account will include labour and material costing. Besides, the 1962 agreement actually says that while Singapore buys in raw water at 3 cents per 1000 gallons, we could sell back to Malaysia raw water at 10 cents! The only thing detrimental to PAP is that it will not earn as much monetary profit as it would from Singaporeans if the raw water price is increased. They will still earn a handsome profit but not as much as it is now. I am only the supporter of truth based on facts, definitely not blind faith on what PAP said. In fact, I have proven that PAP is not trust worthy at all in the territorial water dispute. There wasn’t any internationally recognized maritime boundary at the disputed water and how could it claim to be our territorial water? For some strange unknown reasons, PAP government has not initiated talk on the delimitation of boundary in that area even though Malaysian side has declared its own boundary unilaterally. On top of that, PAP government has overstepped on what Malaysia unilateral maritime boundary point 20 by reclaiming that point for the Mega Tuas Container port. I guess that is the event that triggered Malaysia government to act in defining the port limit at the disputed water, to force PAP government to the negotiation table. « Why the Public Order Act? Send our ministers back to school to learn basic English. With my limited command of English, I tend to agree with Singapore’s interpretation because it did not say “anytime” after the expiry but “after the expiry”. 1st, clown pap S$m liars made a big mistake with Msia. clown pap S$m liars thought they could treat Msia the same they treated 70% sheep. alas. no such thing is possible with Msia because Msia is no 70% sheep. now what is 70% sheep? it is a group of folks in Spore choosing to believe in clown pap S$m liars than in truth. now why is Msia so different from 70% sheep? Msia is a nation now governed by esteemed Dr Mahatir PH which toppled the founding najib BN GE14. 2nd, clown pap S$m liars made the fundamental mistake of zero common sense. clown pap S$m liars can tell the lie contract review ON 25th year only when common sense dictates from 25th year is closer to the intent. now what happens? well esteemed Dr Mahatir rightly sees clown pap S$m liars no up and so need clown pap S$m lying ah neh bala to kowtow. and clown pap S$m lying ah neh bala jolly well kowtow since he tried so hard to BS about the ON 25th year lie. As a citizen, I have zero interest in this price. Whether 3 sen or 30 sen, what’s the diff? It is much more interesting to ask why the CPF return is so low, when other reputable pension funds return 8% long term. Why is our government and CPF Board sleeping on their job, earning us 2.5% long term? @Goh M S; don’t forget PAP has its own dictionary. Within 200M radius is not inside 200M. Acting as President is the same as elected president, so 4 is 5. Indian is Malay. Collision is come in-contact. PAP has the best logic and judgement; “If Mas Selamat is not in Singapore, he must be outside Singapore”. Who could come out such intelligent deduction? Challenge Malaysia to come to Singapore’s court to settle, because I am sure Malaysia can never understand Singapore PAP’s semantics. I am not one in favour of many policies by the current government. I find the tactics by Mahathir is too much to bear and a bully. There is no need for you to supply bullets to these ungrateful pple. Hope that you would not be the next elected MP or rep of our pple. Now if anytime at all, is the right moment to come forward in this legal controversy and call a spade a spade. I say, Singapore will “lost” the case for both issues ! Don’t be “hook wink” by Vivi’s “Bombastic play of words” ! Only sillyporeans will “buy into Vivi’s BS” ! Twisting the English Language and try to Confuse. What a shock this comes from a Minister especially when there is a written Agreement. Then quickly fly to KL to slow talk. Where is the credibility ? “Shall be subject to REVIEW after the EXPIRY” of Twenty-Five year……think CLEARLY it MEANS ANY TIME! What is the problem of water price increase? Say if 3sen to 50sen, the 47sen, then when the treated water is sold back to Malaysia, just add back the 47sen. Problem settled. For domestic usage, just increase the water price by 47sen (or 16c SDGD). Sinkies are brainwashed that the last round of 30% water price increase is to appreciate the important of scare resources we have. 70% will be very happy to pay 16c more for social awareness and patriotic reason. We voted you to look after us. Don’t waste time fighting over this petty matter. Do what you have done for the maritime boundary. It was rightful ours, but not become no entry zone. Matter can be settled amicably. Be a good neighbour. We spent a huge percentage of our budget in military. We purchased airplanes and other machineries. We may not have the land to park these. Why not share these resources with Malaysia? They may allow us to train and hold our airplanes and machineries there. Anyway, we have the 5 nations treaty. Last night, I read our government people are in Malaysia Parliament too. When Kra canal is cut, or China OBOR is done, we are no longer competitive. We will rejoin Johor then. ….and all the time we peasants tot the cambridge or oxford ed miws were smart 1st class mini*stars! always threatening us saying w/o them SG will fall , etc etc. their dictionary is specially made ones..only meant for PAPs. its able to twist meanings to their owners’ advantage …if cannot just charge or sue, mostly peasants. But Mr Goh u are not a lawyer. And your english A1 or distinction ? Hopefully not c6 or c5 ? There has to be a reasonable time limit within which the agreement has to be renegotiated or the party (in this case, Malaysia) loses the right to do so. It has been long past the 25 years (1987). Malaysia could also lose the case if the international court decides that the MGovt has waived its rights by not acting within a reasonable time. Dr M will have to wait another generation before he can have his ways with SG. He won’t be around by then! LOL! Kra canal ? This story again and again and again. When going to happened ? you mean the white idiots are not bullies in their own backyard where they can be the both the referee and player at the same time. this is the taste of their own bitter medicine. and yes, by right we should be siding with our own garment – loyalty right ?. but our garment has said that sinkie land belongs to everyone leh (open-leg policy) and it seems they have been treating daft sinkies like some golden goose to be milked (fooled) with all their wayang – 4 = 5, selected = elected. are the white idiots loyal to the average daft sinkies ? they are so arrogant and snobbish, the way they have behaved and made those higher-than-thou statements. yar lor. long live “ownself-check-ownself” as though this is going to be any better. After the 2 incidents of dumping chemicals in their river, now we have rubbish mountain uncovered. Real embarrassment for Dr M and PH. The professional lawyers should be able to interpret correctly, not layman.